How does your garden grow? Book-loving Lola is inspired by a collection of garden poems that she reads with her mommy. She wants to plant her own garden of beautiful flowers, so she and Mommy go to the library to check out books about gardening. They choose their flowers and buy their seeds. They dig and plant. And then they wait. Lola finds it hard to wait for her flowers to grow, but she spends the time creating her own flower book. Soon she has a garden full of sunflowers and invites all of her friends for cakes and punch and a story amongst the flowers. Lola is a beloved character that continues to shine for young readers. Her curiosity and love of books is infectious. Parents and children love sharing Lola's stories. Rosalind Beardshaw's beautiful illustrations highlight Lola's close-knit family and how they use stories and books to interact with their world. 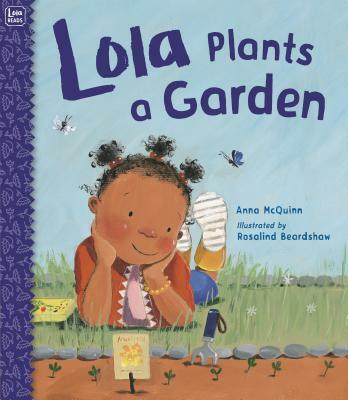 Lola's brightly colored and growing garden is the perfect surrounding for this bright little girl. Rosalind Beardshaw studied at Manchester Polytechnic where she earned a degree in illustration. Since graduating in 1992, she has illustrated many children's books, including two of her own stories; Grandma's Beach and Grandpa's Surprise (Bloomsbury) inspired by long summer holidays spent with her playful grandparents. In her spare time, Rosalind works as a volunteer with adults who have learning difficulties. She lives in York, England. Lola at the Library "Perfect for instilling a love of libraries and books in the youngest patrons, it's a winner."